The Ohio University Marching Band will perform in the world-famous Tournament of Roses Parade in Pasadena, California, on New Year’s Day. The Tournament of Roses Parade is seen by approximately one million in-person spectators, a domestic audience of 40 million television viewers, and an additional estimated 350 million television viewers in over 100 countries. The parade begins at 11 a.m. EST and will be nationally televised on the ABC and NBC networks, Hallmark Channel, Travel Channel, Univision and several others. The Marching 110 is scheduled to perform in the middle of the parade's more than 90 units. Saturday, Dec. 26 — 1 p.m.
Join the crowd at Ford Field in Detroit for the fourth bowl game appearance in Ohio Football history. Ohio is the home team, which means the cameras will be on the OU section of the stands throughout the game. You and your Bobcat gear could be on national TV! OU heads back to Ford Field on 12/26 to face Marshall in the Little Caesars Pizza Bowl. Complete details on the game and tickets are posted on Ohio Bobcats.com. If you're going up for the game, be sure to enjoy kegs & eggs at the pregame party for all Bobcat fans. Information will be posted on Bobcat Bash.org as it becomes available. A Cleveland-area game watch party is in the works. Watch this space for details! 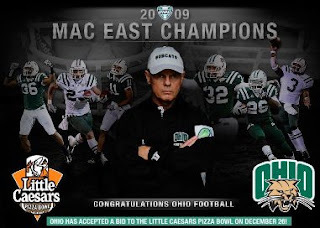 Your Ohio University Bobcats are the 2009 MAC East champions! The team heads to Detroit's Ford Field to face the Central Michigan Chippewas on Friday, December 4, at 8 p.m. The Bobcat Bash starts at 6 p.m. Enjoy food and beverages with fellow fans before cheering on the team. If you can't see it in person, be sure to tune in to ESPN2 for complete coverage. Support scholarships for OU students by enjoying a tasty meal at the California Pizza Kitchen in Legacy Village. Just bring in this flyer on Monday, November 30, and present it to your server when ordering. Twenty percent of your check will be donated to the scholarship fund of the Ohio University Parents Club. The club traditionally awards $1,200 scholarships each school year to students from the Greater Cleveland area. The number of scholarships available depends on the success of the club's fundraisers. Bobcat fans, the game of the year is here — Ohio vs. Temple for the outright MAC East title! Don't miss any of the action Friday in Peden Stadium as the 'Cats will host their last regular season game of the year and scratch for another MAC East title. Kickoff is set for 11 a.m. This game is huge! All season ticket holders should have received a letter in the mail from Coach Solich offering an allotment of free tickets to this game as a way of saying thank you. As another form of saying thank you to fans, Ohio Athletics is offering all general admission tickets to the Temple game for only $5! That's only five bucks to see a game that will crown a champion. The football team needs your support! Make Black Friday a green one. We'll see you in Peden Stadium! The game will also be nationally televised on ESPN U. Go 'Cats! 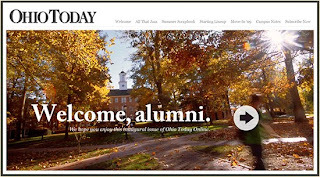 More OU videos than you can click a mouse at are posted on the Ohio U Alumni's channel on YouTube. From Marching 110 performances to student projects to beer cheese soup at the Pub (! 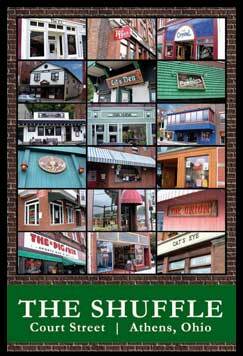 ), you can get your fill of Athens no matter where you are. On Monday night, the Marching 110 is going to rock out at the Ohio Theatre in Columbus. The theater opens at 7 p.m.; the show — featuring all of the music played during the 2009 marching season — starts at 8. All 110 fans know that the show is well worth the trip! Join the Marching Band Society of Alumni and Friends and the Central Ohio Alumni Chapter for a pre-show party at the Ringside Cafe from 5 to 7:30. The Ringside Cafe is located at 19 N. Pearl Street (off Broad Street, across from the Statehouse). There's no cover, but plenty of OU raffle prizes and drink specials! Questions? 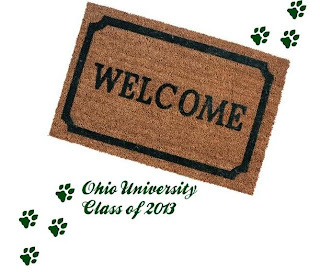 Contact Dawn at 740-593-4300 or dwerry@ohio.edu. If you can't make it to the party or concert, please considering making a donation online: www.ohio.edu/development. Stay up to date on OUMBSAF events at www.oumbsaf.org. 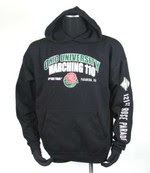 Get some Rose Bowl-themed hoodies and shirts at the College Book Store. 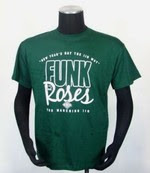 Proceeds support the Marching 110's trip to Pasadena in January. The 6-3 Bobcats make a national TV appearance at 7 p.m. Tuesday when they battle Buffalo on ESPN2's College Football Primetime. You can also listen online at Ohio Bobcats.com. 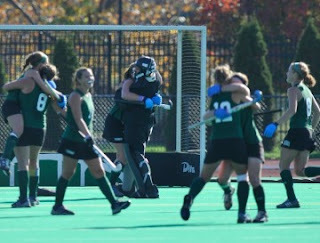 Plus, congrats to the members of the OU field hockey team for beating Miami and claiming the MAC championship! This is their third MAC title in four years. The team takes on the ACC champs on Tuesday at 1. Follow the action on Ohio Bobcats.com. An inside look at the move-in weekend, the latest news and more! Read all about it in The Post . . .
Monsters, convicts and even Jesus traveled to Court Street Saturday night to raise a ruckus - resulting in a few arrests and disputes. Police said Halloween 2009 was uneventful, despite a couch fire on Palmer Street, and yielded about the same number of arrests as last year. Some fun reading, courtesy of The Athens NEWS . . .
Now is the time to return to campus! 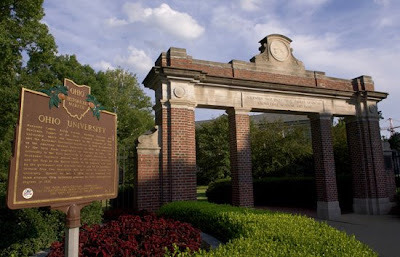 If you need more information, feel free to get in touch with the Ohio University Alumni Association via their Facebook page, Twitter feed (@OHIOAlumni) or Web site (www.ohioalumni.org). On Saturday, Ohio Football returns to Peden Stadium for a Homecoming battle with rival Miami. The Bobcats are 4-2 overall and 2-0 in the MAC, and are coming off two consecutive MAC road wins. The 'Cats most recently downed Akron 19-7 on Saturday, and you can read the recap here. Kickoff for Homecoming is set for 2:00 p.m., and good seats are still available. "Be Seen in Green", as all fans are encouraged to wear GREEN to the game. To purchase tickets, visit the Ohio Athletics Ticketing Site here. Don't forget about the Pepsi TailGreat Park either! To reserve your space call the Ohio Athletics Marketing Office at 740-593-1168. If you're going to Saturday's OHIO vs. Akron football game, stop by the Barley House to get your green on at the Bobcat Bash! Click here to get all of the details and RSVP. Officer elections for the Greater Cleveland chapter are next month. If you'd like to be more involved in the chapter, submit your proposal by October 15. Your Ohio Bobcats are coming to Akron this Saturday — stop by the Bobcat Bash at the Barley House and head to the new Infocision stadium to cheer them on! Contact the ticket office to reserve your seats: 1-800-575-CATS. Stand up and cheer when the Bobcats come north to tackle the Falcons and the Zips! Join OU alumni, family, and friends for pre-game parties in Bowling Green and Akron. Spruce up your space with some official OU decals from Fathead . . . .
You'll be able to show your love at the next alumni happy hour. The Greater Cleveland chapter is teaming up with the Marching 110 Society of Alumni and Friends for a special event to benefit the 110. 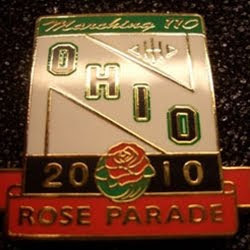 The band will be marching in the Rose Bowl Parade in January 2010, but it needs our help to get there! Come party with a purpose on Friday, August 28, at the Barley House in the Warehouse District. Stop by after work for food and drink specials, raffle prizes, and other contests and games. If you'd like to help with the event — perhaps by donating a raffle prize or displaying your 110 memorabilia — please contact Rob Dintaman, president of the Marching 110 Society of Alumni and Friends. Want your own Marching 110 beer cozy? Kappa Kappa Psi is selling them to raise money for the trip. Contact Allison Taylor for more information. The Ohio-Connecticut football game, scheduled for 7 p.m. on Saturday, September 5, has been picked up by ESPN360.com. 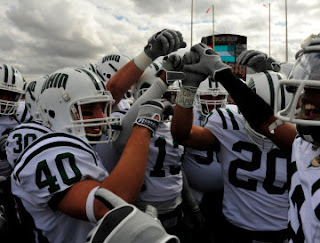 Help sell out Peden Stadium when the Bobcats open the 2009 season against the Connecticut Huskies. Tickets to the UCONN game are available for only $5 before August 5. To order your tickets call 800-575-CATS (2287). Fresh roma tomatoes drizzled with imported aged olive oil and balsamic. Topped with fresh basil, salt and pepper. Prosciutto with aged Romano cheese served with baguette bread. Mamma’s Meatballs served in a pool of fresh tomato sauce. Topped with fresh herbs and shaved Romano cheese. $25 per person; includes a donation to the scholarship fund. Contact Jason Nedley (president@clevelandbobcats.com) for more information. Want to "graduate" from college in just three days? Relive your student experience and attend enriching workshops presented by OHIO's talented faculty on a variety of topics ranging from happiness and altruism to poetry and biofuels or hear top experts David Wilhelm, BA '77 and Professor Richard Vedder debate the economy. It's time for the annual golf outing, so dust off your clubs and put together a foursome . . . This year's event will once again feature the Marsh-Mulligan: Whoever hits a marshmallow the farthest can take two strokes off! Plus, we'll be raffling off some great prizes, including . . . 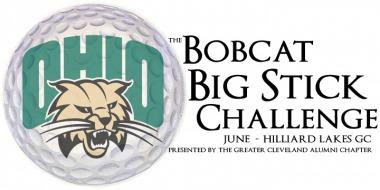 If you or your company is interested in sponsoring part of the event, please e-mail the chapter president, Jason Nedley: president@clevelandbobcats.com. The Bobcat Caravan gives alumni and fans the opportunity to meet OHIO Athletic head coaches and administrators in a relaxed, fun atmosphere. Bobcat Caravans are free of charge and offer light snacks and beverages. This a great opportunity to show your green & white pride! The Cleveland event will feature Ohio head football coach Frank Solich AND head men's basketball coach John Groce, PLUS head women's basketball coach Semeka Randall. 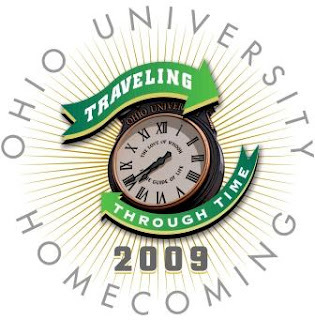 Through events such as the Bobcat Caravans, the Bobcat Representative Club looks to enhance relationships with Bobcat fans, alumni and friends and Ohio University. Visit the Ohio Athletics Web site for more information about the Bobcat Representative Club and the complete schedule of the Bobcat Caravan: www.OhioBobcats.com. Come out on the 27th to sample some brews and chat with other area alumni. You'll also have the chance to hear some news from the university, courtesy of the dean of the College of Education. For more information and to register online, visit ohioalumni.org. Take a quick trip to Akron next week for a recital by the Ohio University Lyric Duo. The Duo consists of Alison Brown Sincoff, flute & piccolo and Gail Berenson, piano, both faculty members of the Ohio University School of Music. The performance is open to the public and admission is free. For more information on the duo, please visit Gail Berenson's Web site: www.gailberenson.com.